What Temperature Range for PVC Pipe? PVC pipes are made of a plastic called polyvinyl chloride; this material is extremely versatile and easy to work with. It is a natural phenomenon that all materials expand when the temperature increases and contract when the temperature decreases and PVC pipes are no exception. In addition to the dimensions changing with temperature, the stiffness of the material and its ability to maintain pressure are also affected. 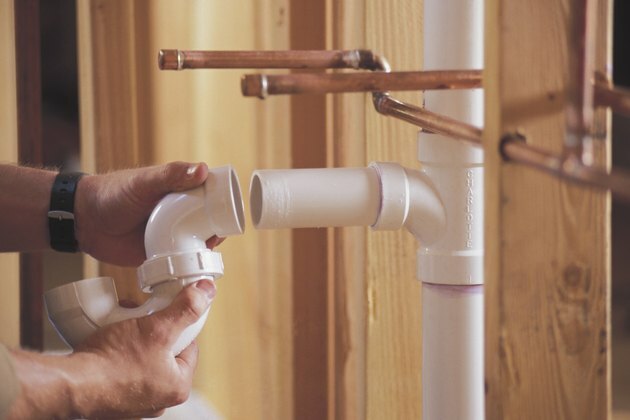 Nevertheless, PVC pipes are very popular and commonplace in plumbing projects. PVC piping is exceptionally versatile. Standardized reference points for all published PVC dimensions usually apply to a temperature of 73 degrees F. Colder temperatures typically do not affect PVC piping's strength, but as PVC piping gets warmer, it becomes more pliable and less able to hold pressurized fluid. The precise upper temperature limit can vary slightly depending on the exact specifications of the PVC pipe. However, generally speaking, the upper limit of PVC pipes is 140 degrees F; beyond that temperature, the PVC piping is at risk of losing its structural integrity. Temperature changes can cause slight variations of the dimensions of PVC piping, most notably in the length of the pipe. Generally speaking, you can expect a change of approximately 3/8-inch in length per every 100 feet of piping for every 10 degree F temperature change; this rule is typical of all PVC piping regardless of diameter. This phenomenon occurs both with increases in temperature, from the baseline temperature, and with decreases in temperature. The pressure capacity of the PVC diminishes from the baseline of 73 degrees as the temperature increases. To determine the diminished pressure capacity, you should use the following numbers: at 80 degrees, multiply the baseline pressure by .88, at 90 by .75, 100 by .62, 110 by .52, 120 by .40, 130 by .30, and 140 by .22. For example, if the PVC pipe has a baseline pressure capacity of 400 PSI at 73 degrees Fahrenheit, then the pressure at 110 degrees would be produced using the formula 400 x .50 = 200; your new pressure capacity is 200 PSI. Decreasing temperatures do not adversely affect the baseline pressure capacity of the pipes; for temperatures below 73 degrees F, you should refer to the published baseline pressure capacity. The pressure capacity of the PVC diminishes from the baseline of 73 degrees as the temperature increases. To determine the diminished pressure capacity, you should use the following numbers: at 80 degrees, multiply the baseline pressure by .88, at 90 by .75, 100 by .62, 110 by .52, 120 by .40, 130 by .30, and 140 by .22. For example, if the PVC pipe has a baseline pressure capacity of 400 PSI at 73 degrees Fahrenheit, then the pressure at 110 degrees would be produced using the formula 400 x .50 = 200; your new pressure capacity is 200 PSI. Decreasing temperatures do not adversely affect the baseline pressure capacity of the pipes. For temperatures below 73 degrees F, you should refer to the published baseline pressure capacity.